Spring has come to Tickety Town! On March 25 families everywhere can enjoy Spring time with their favorite friends in Tickety Town. The collection includes six fun-filled spring episodes. Including “Spring Chicks Time,” the newest title from the Tickety Toc DVD series. Easter is just around the corner and the "Spring Chicks Time" episode is the perfect way to celebrate! 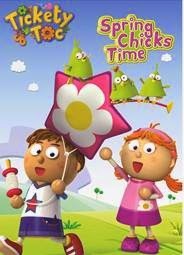 In “Spring Chicks Time”, the adorable duo, Tommy and Tallulah, celebrate the season with a town wide picnic, an epic nature hike and a kite-flying contest! 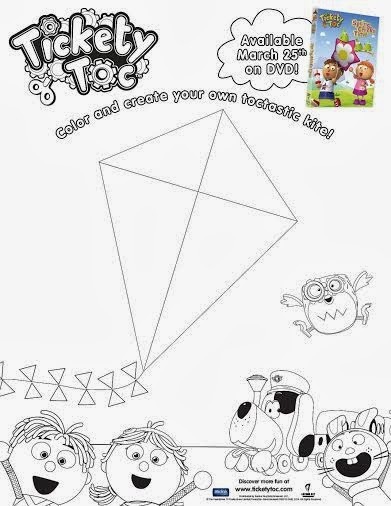 When the mischievous Spring Chicks fly off in one of the kites, the town must save them just in the nick of chime time! As always the Tickety Town team, teach preschool viewers the importance of teamwork, community and social responsibility. My son loves Tommy and Tallulah and can be heard yelling Chime Time whenever they come on TV. To help celebrate the release of “Spring Chicks Time,” Anchor Bay has scooped-up an exciting national cross-promotion with Joy Cone. From April 1 through December 31, for $2.50 shipping & handling, consumers who purchase a Joy Cone product and any Tickety Toc DVD can receive two free Tickety Tocbooks from Scholastic. Color box art from the “Spring Chicks Time” DVD will be featured on 1 million boxes of Joy Cone product as part of the “tick tocktastic” promotion. Tickety Toc teaches teamwork, social responsibility and problem solving. Tickety Toc has quickly become the #1 afternoon show on Nick Jr. (Nielsen) and has been picked up for a second season. And 1 very lucky Simply Me reader has the chance to win Tickety Toc Spring Chicks DVD and a coupon for a Free Box of Joy Ice Cream Cones!